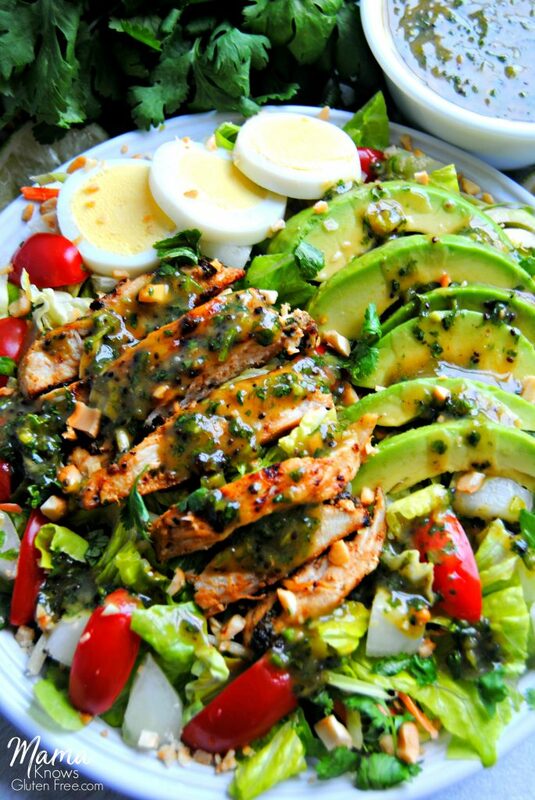 Mama’s take on Grilled Chicken Chimichurri Salad. 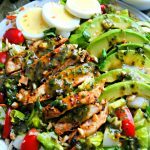 A super favorable twist on traditional chimichurri sauce is both the marinade and dressing for this glorious grilled chicken salad. Disclosure: Mama Knows Gluten Free received the products mentioned for free. Regardless, we only recommend products or services we use personally and believe will be good for our readers. When I saw a beautiful Grilled Chimichurri Chicken and Avacado Salad on Facebook from Cafe Delites I immediately wanted to make it. But I can’t handle the heat of peppers and my husband needs to stay away from nightshades, so I went to work trying to figure out how I could do a nightshade free (no peppers) version of Chimichurri sauce. When Betsy’s Best Gourmet Butter sent me their cashew butter to try, a light went off and I thought about one of my favorite dipping sauces. 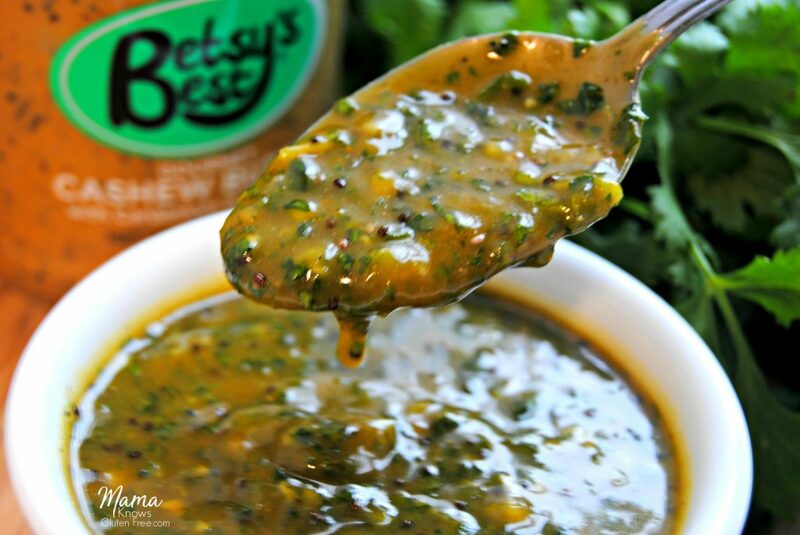 Thanks to Betsy’s Best for partnering with Mama Knows Gluten Free on this Chimichurri Sauce recipe. You may want to make a double batch because you are going to want to drizzle it over everything! Chimichurri sauce is both a perfect marinade and salad dressing. What makes my chimichurri sauce so different from the traditional sauce, is the cashew butter. It is sweetened with honey and has no peppers. It still has all of the other ingredients of a traditional chimichurri sauce, but it’s definitely a twist on traditional chimichurri sauce. This super flavorful sauce only takes a few minutes to make by chopping the ingredients in a food processor (you can also chop by hand). After marinating the chicken breasts in the chimichurri sauce for a few hours, I grilled them in my ceramic grilling pan and they came out perfectly. I was really happy that the grilled chicken turned out so flavorful and juicy. I seriously can’t handle dry, grilled chicken – no matter how much sauce you pour on top of it! I try and eat a big beautiful salad for lunch every day. This salad is one of my favorites. The grilled chicken is perfectly marinated and the chimichurri sauce makes a perfect dressing to drizzle over your favorite salad fixings. Looking for more gluten-free salads? your favorite salad fixings pictured: romaine lettuce, avocados, cilantro, cucumbers, chopped cashews, chopped super blend mix, grape tomatoes, hard boiled eggs and a squeeze of fresh lime. In a food processor puree cilantro, garlic, green onions, and cumin. In a microwave-safe bowl stir together cashew butter, vinegars, turmeric, honey and microwave for 1 minute. Add the cilantro mixture to the cashew butter mixture and stir until fully combined. Pour olive oil into the combined mixture and stir to finish the sauce. Add two chicken breasts to a large plastic storage bag and pour 1/2 cup of the chimichurri sauce over the chicken. Seal the bag and allow the chicken to marinate for at least one hour (the longer the better). Add olive oil to your grill pan. Grill the chicken breasts on both sides until completely cooked. Allow chicken to cool before slicing it for the salad. Chop your favorite salad fixings. Place grilled chicken on top of salad. Drizzle, or pour (like me) the chimichurri sauce all over the salad. Did you make a recipe? Tag @mamaknowsglutenfree on Instagram, Facebook or @mamaknowsgf on Twitter! My mouth is absolutely watering! Must get all the ingredients! Yes! Hurry! Oh and make a double batch because you are going to want to put this sauce on everything! Love this recipe combination! It looks delicious and nutritious and I can’t wait to make it! Thank you Betsy for sharing your amazingly delicious cashew butter with me. It was just what this recipe needed! Sounds delicious. I’m trying to stay away from sugars that raise insulin. What would you suggest as an alternative to the honey to get the taste and or volume necessary? Hi Mary! You could try agave nectar as a substitute or You could also try stevia as a sweetener. How is it nightshade free, when you have tomatoes in the recipe? Hi Tamara. The marinade/salad dressing is nightshade free. Most chimichurri sauces are made with chile peppers, which is a nightshade. My recipe does not have chile peppers in it. You can add your favorite salad fixings to your salad, according to your tastes and dietary needs. If you are nightshade free then you would not eat tomatoes on your salad. Thank you for asking. Hi, Clara, you could use almond or peanut butter. Using those other kinds of butter will taste a little different, but it will still be tasty. I buy cashew butter at Walmart. They sell their own brand of cashew butter so it’s budget friendly too. Are grape tomatoes not a nightshade vegetable/fruit? Just wondering because I was going to start a nightshade free diet. Hi Camile grape tomatoes are nightshades. My husband cannot eat nightshades. The chimichurri marinade/dressing is nightshade-free. If you are following a nightshade-free diet then you would not add grape tomatoes to your salad. I hope you enjoy it!